We were watching swans eat, but I was thinking about how we used to eat swans. For a recipe I went to Le Menagier de Paris, a 1393 guidebook that purports to be an wise older man giving advice to a newlywed wife, emphasizing the crucial theme of womanly obedience. There are instructions for preparing dishes like frumenty (a thick wheat porridge served with venison) and lardy milk (“Take milk of cows or ewes and put to boil in the fire, and throw in bits of bacon and some saffron: and have eggs, that is both white and yolk, well-beaten and throw in all at once, without stirring, and make it all boil together, and then take it off the fire and leave it to turn”). 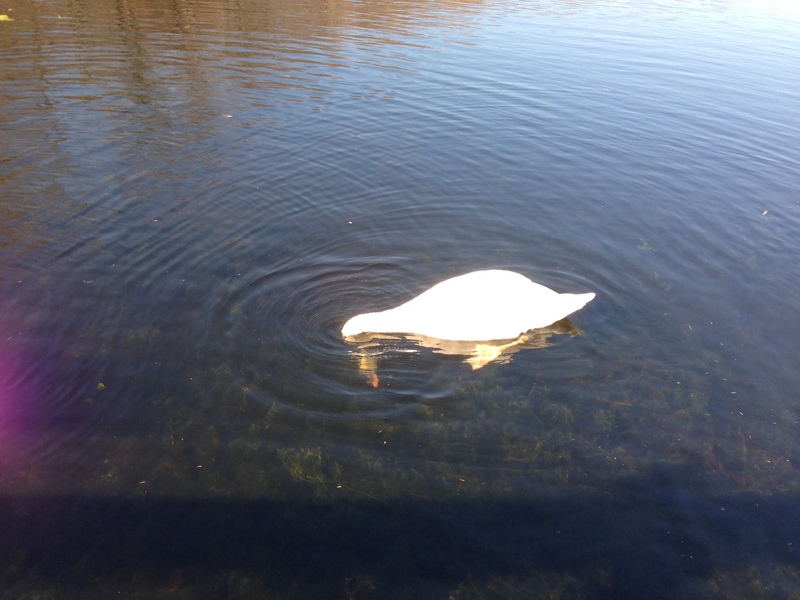 But the coup de grace is a gilded swan that might grace the table for a wedding feast. Now, them’s some fancy eats! However, I should think eating silver would be a bad idea. The latter part instructs one to coat the prepared bird in a light covering of silver, right?